Sunbeam Alpine restoration and other stuff. 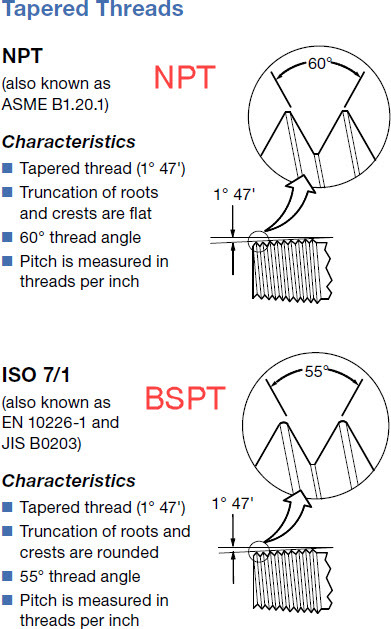 I learned today that there are at least two types of tapered pipe thread in common use in the automotive world: NPT and BSPT (also known as ISO 7/1). BSPT is quite different from NPT. Here’s a snippet from a Swagelok catalog showing the differences. 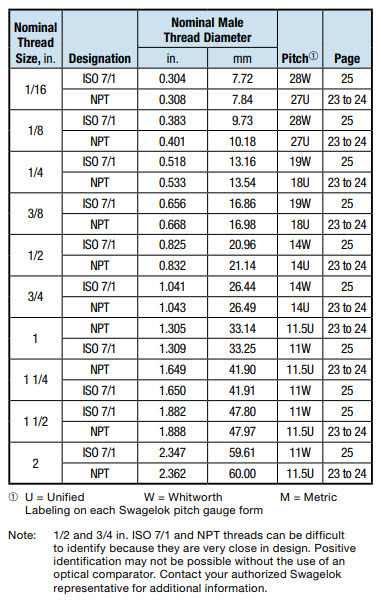 Note that it is extremely difficult to tell the difference between a 1/4 BSPT and 1/4 NPT fitting by eye. Even if you have the two fittings side by side, the one-thread difference in TPI is not noticeable on short threaded sections, even with a thread gauge in hand, and the difference in thread shape is really only apparent when the fastener is held tight against a good thread gauge and viewed with magnification. Dragons. The best way to tell the difference that I have found is to take a caliper and measure the major diameter about 4 threads into the fitting, starting at the narrow end of the taper. There’s enough of a difference (about 0.015″) that if you have the table above in front of you it should be obvious which fastener you have in hand. If you try to install an NPT fitting in a BSPT threaded hole, something will feel “off”, the fitting will jam within the first couple threads and it may not seal correctly. Don’t fall into the trap I did and assume that all tapered threads MUST be NPT. My false assumption was that because the British used our thread system for fasteners, they used our pipe taper. WRONG! And definitely don’t assume that there must be something wrong with the female threads, go out and buy an NPT tape set, and re-thread the hole to NPT. Don’t! The lesson here is to check twice, maybe three times before cutting metal, and that the Sunbeam Alpine, being old and British, uses BSPT for all of its tapered pipe fittings, including those on the engine block and the water pump. This kind of thing falls into the category of “stuff they should tell you when you get one of these cars” because I’m sure I’m not the first person to run down to the hardware store for a fitting and get completely blindsided by BSPT and Whitworth threads. Dragons!